Portable Ice Makers, also known as Countertop Ice Makers, are gaining in popularity as convenient and efficient solutions for gaining the drink chilling magic of ice cubes anywhere. Naturally these small, handy ice makers derive their name from being easy to carry around and transfer from place to place and small enough to be stationed on a countertop or serving area without hogging up all the room. Many shapes, sizes and variety of countertop ice makers are on the market, and all of these models have functionally one thing in common - they all use water. Any appliance that uses water to perform its service inherently comes with the risk of leaking. This is only natural, as water always wants to get out of any container in which it is held. So whether it is directly out of the machine itself from a malfunction or maybe through the mishandling of an inebriated guest, it is highly likely that water will escape the ice maker’s confines. In these times it is wise to have a containment solution that protects your home and belongings from potential water damage. According to the Ice Maker Experts’ blog, due to the extensive use of these types of ice makers, it is not uncommon for problems to arise. Some helpful advice on accident prevention is to always keep your portable ice maker properly cleaned and maintained. As the Experts say in their blog, “Most of the problems that you encounter like when the unit does not generate enough ice or when there is a water leak, it can be attributed to certain substances blocking the essential components of the ice machine.” So routine maintenance should be followed to avoid mishap. But as is the case with any appliance, even the most well maintained, there will be times when the machine breaks. In those times a sturdy drip pan can save a lot of time and money. A quality stainless Countertop Ice Maker Pan from Killarney Metals will look gorgeous while doing it too! Due to the portable nature of Countertop Ice Makers, choosing a drip pan to hold these ice machines requires contemplation and planning. Is the ice maker going to stay in place on the counter or will it be moved often? How large is the ice maker and how much water does it hold? Are there any moving parts of the ice maker that may be obstructed by a drip pan? 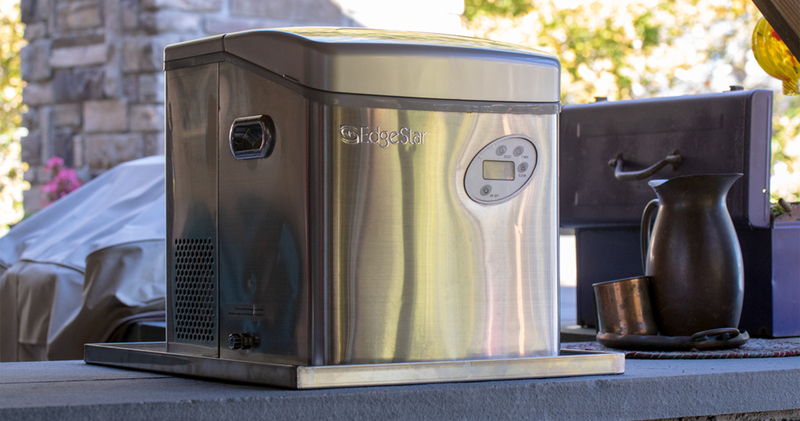 Will the ice maker be used outdoors? How often will the ice maker be accessed for ice? There are lots of considerations. At Killarney Metals we like to make thing a little more simple. The key to choosing a drip pan for a countertop ice maker is to make sure that the volume of water held in the machine is not larger than the volume capacity of the pan used to protect against spills. Refer to the volume specifications from the ice maker documentation and then choose a drip pan that will match or be greater in volume than referenced. There, the big consideration is covered. Now, if you are using the pan outside or if aesthetics are important to you, choose a stainless steel Ice Maker Drip Pan. These pans look fantastic, matching the appearance of the stainless ice maker versions, and they have the best corrosion resistance. If aesthetics are less important, a galvanized steel version of the Ice Maker Drip Pan will work. If you plan on taking advantage of the portability of a Countertop Ice Maker, we suggest choosing a lighter weight metal pan. 20 gauge metal material is light enough to be carried easily, while tough enough to stand up to the dings and drops that can break plastic pans. Make sure your length and width dimensions on your Portable Ice Maker Drip Pan is larger than your ice maker’s maximum size. You will also want to make sure the wall height does not interfere with any of the moving parts of your ice maker. Note however that the volume capacity should always be considered first and foremost in your planning. Drip Pans are awesome when it comes to protecting your home from water leaks. They are such simple, effective solutions that are easy to use with the bonus of not breaking the bank. How fantastic is it that a simple square pan designed to hold your ice maker can save you from a water leak damaging cabinets, counters and floors. That is a lovely thing. Killarney Metals produces a variety of Ice Maker Drip and Drain Pans made out of stainless steel and galvanized steel to be used in residential and commercial environments. We also custom manufacture drip pans to the size required. For more information on Killarney Metals’ stainless steel Countertop Ice Maker Pans click here or contact our helpful staff at 877-801-7417.